Alright, let’s just get this one out of the way. Today’s installment of Best Picture Reviews is often listed as one of The Academy’s greatest mistakes and is directly responsible for my father refusing to watch The Academy Awards, which has now stretched to thirty years. 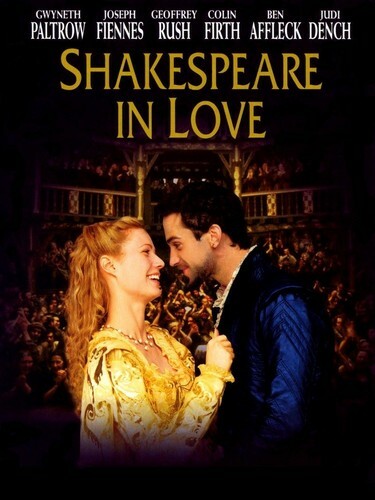 Today, I review Shakespeare In Love. The film stars Gwyneth Paltrow and Joseph Fiennes and is directed by John Madden (no, not that John Madden). It’s about a young William Shakespeare (Fiennes) who has sold his next play but suffers from extreme writer’s block, lacking inspiration. Then, he meets the beautiful Viola de Lesseps (Paltrow), a huge theater enthusiast and a big fan of Shakespeare’s work, who begins to dress as a man in order to get on stage and act, since at the time men were the only ones allowed to act. Shakespeare sees through the disguise and the two, despite him being married and Viola being promised to some other rich guy, begin a passionate love affair that Shakespeare uses as inspiration for writing his play. I first saw this film in the theater when it came out and thought it was a really good movie. I rewatched it years later and it still stood up for me. The film has a lot of humor in it which is what makes it enjoyable and a lot of entertaining characters that make you want more of them, like Geoffrey Rush’s crude yet hilarious character Philip Henslowe. Even Affleck’s small role as Ned Alleyn is pretty amusing. The film also has a decent premise even though it reads like a sappy romantic comedy. The acting is good, apart from Joseph Fiennes who just completely overdoes it in this movie. You can tell that he is acting. Nothing feels genuine or natural with his delivery, tone or body movement. He’s there to react and I find his performance in this boring and uninspired for that reason. Paltrow was good as she juggled the personas of both Viola and Thomas Kent masterfully, which helped lead to her snagging the Best Actress Oscar from a very formidable Cate Blanchett that year who was nominated for her role as Queen Elizabeth I in Elizabeth. I’m not sure Paltrow’s performance was Oscar-worthy but she was certainly great to watch in this, a highlight for me in this film certainly. Judi Dench’s performance as Queen Elizabeth I (that’s weird) nabbed the Best Supporting Actress Oscar even though it was a very minimal role. Not sure she deserved an Oscar for that role either but the lack of competition that year probably had more to do with it. What makes the film enjoyable for me is the supporting cast and minor characters. They were all great and fun and give the film a great sense of camaraderie. I felt part of their crew, enjoying the fun, the work and the crazy drinking after rehearsals in the pub. Talking about Oscars inevitably leads us to it controversially taking home Best Picture over some pretty steep competition. It was up against Elizabeth, a biographical period piece about a queen, which is a film right up the alley for the Academy. Also nominated was Life Is Beautiful, a very unique and quirky perspective on the Holocaust if I’ve ever seen one. Such a beautiful story. But, we all know what film that year was the main competition. Saving Private Ryan was a monster of a film. Skillfully done, with an untouchable premise, great acting and one of the greatest opening scenes to a film ever. It is without a doubt, in my opinion, the last great war film. If you saw both films that year, you knew without a shred of doubt which was going to live forever and be regarded as a classic. As good as Shakespeare In Love is, it isn’t anything close to being a classic and it didn’t deserve to win the Oscar for Best Picture that year. It should’ve gone to Saving Private Ryan and will always remain one of the biggest sins the Academy has ever committed, and in the eyes of my father, remains unforgivable. Shakespeare In Love, at its core, is a romantic comedy but, with it’s tongue in cheek humor is told in a rather clever way. It continues to engage the audience even when the tone turns away from being silly. You wonder if the love the two have for each other is just passion at play and fleeting, or if it will last. Will their affair effect the production of the play and the other actors and end up ruining Shakespeare’s career? There’s risk in the storyline that keeps the viewer tied to these two characters. As much as I don’t feel it’s a film that is Oscar worthy, it’s still a really solid film that is funny and entertaining. I give this film **½ out ****.